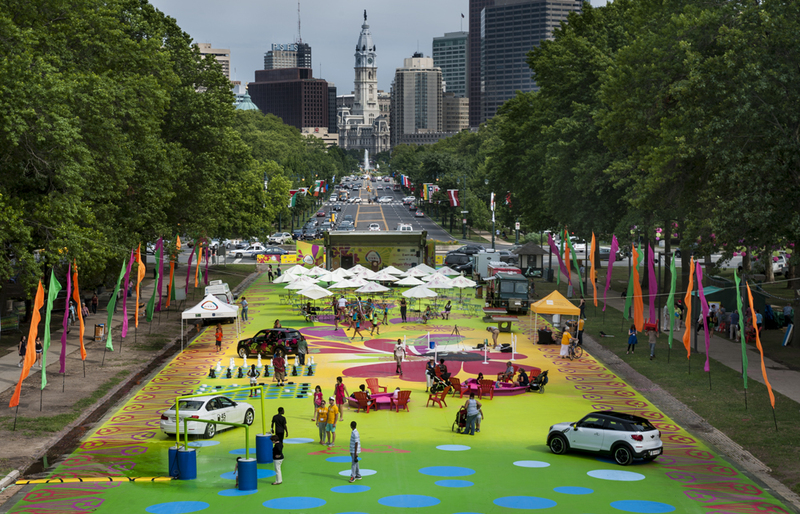 Commissioned by the Association for Public Art, artist Candy Coated transformed The Oval in front of the Philadelphia Museum of Art into a magical environment of color, pattern, illusion, and movement with Magic Carpet. The artist’s exuberant design included 3-D illusion art, brilliantly colored sandboxes, oversized game boards, and her signature decorative motifs rendered in vinyl, among other unique attractions. 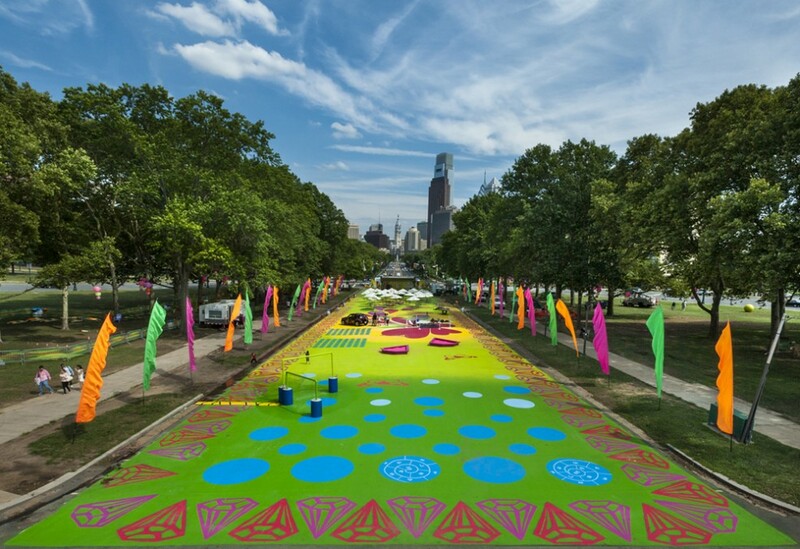 Magic Carpet was featured from July 16 – August 17, 2014 at The Oval, an initiative of Philadelphia Parks & Recreation in partnership with the Fairmount Park Conservancy. 1. 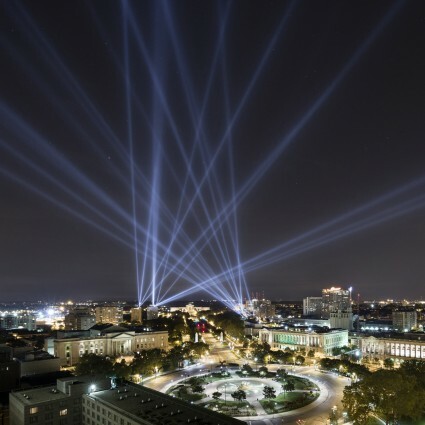 “Welcome” – Visitors were welcomed to the Magic Carpet at The Oval with a pathway pattern of blue circles that resembled stylized clouds. 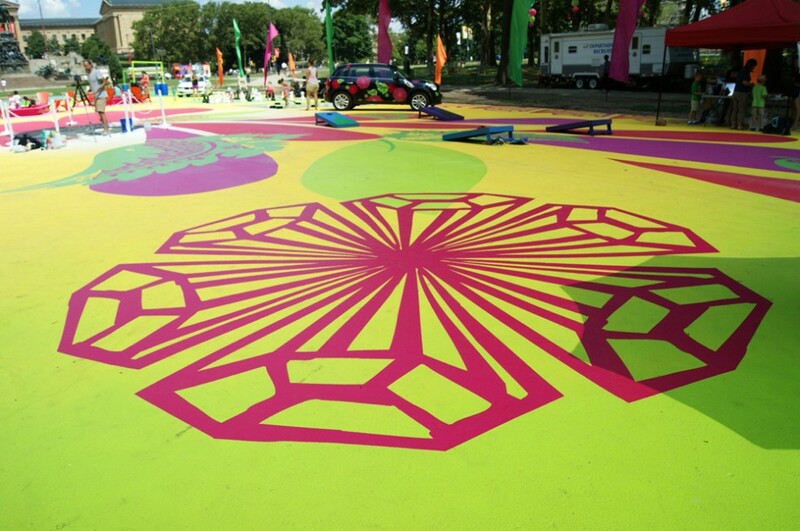 This area hosted The Oval stage covered with the artist’s signature designs in the vibrant colors that encompass the Magic Carpet experience. 2. “The Garden Labyrinth” – This area accommodated food trucks along the perimeter and French café tables, chairs, and umbrellas at the center of the site. Under foot was an elaborate arrangement of large diamond shaped rondelle forms that suggested a labyrinth network. Many of the umbrellas on the site were painted with diamond forms that placed visitors in the midst of a space that was energized by pattern and movement. 3. “Totally out of this World (Light Blast)” – This area featured a trompe l’oeil (or trick of the eye) light blast meteor crater, an optical illusion that was a great photo opportunity for visitors. Bright light and gemstones burst from deep below to challenge the senses. Also incorporated into this area were oversized game boards and ping pong tables. 4. 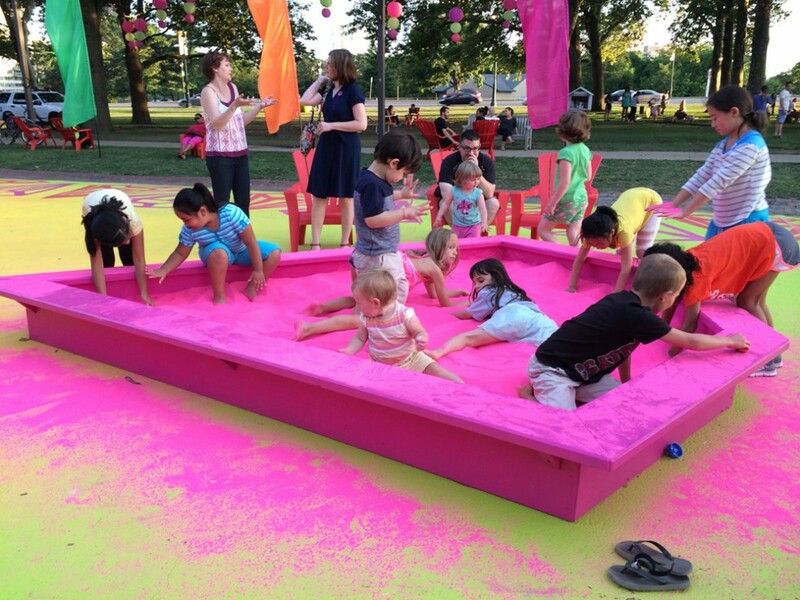 “Sensory Transportation” – Visitors could play in diamond shaped sandboxes filled with brilliant pink colored sand, and a water mister feature provided sensory relief and respite. 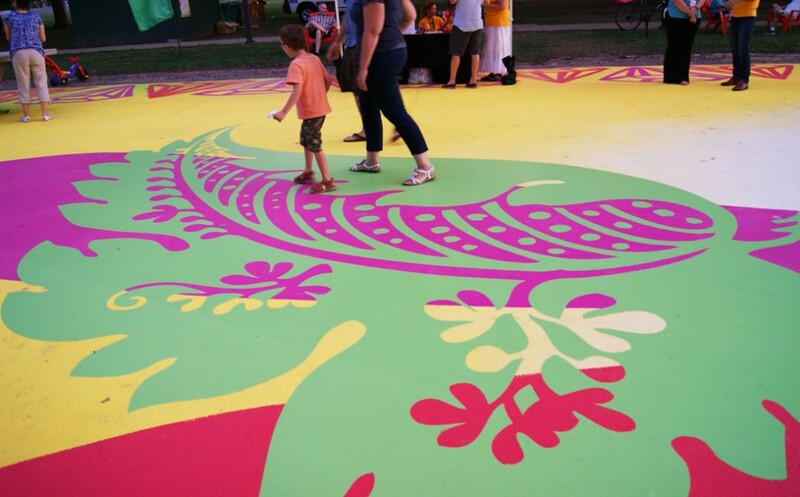 Visitors could explore the giant butterflies and try hopscotch among the pattern of blue circles that bookended Magic Carpet. 5. 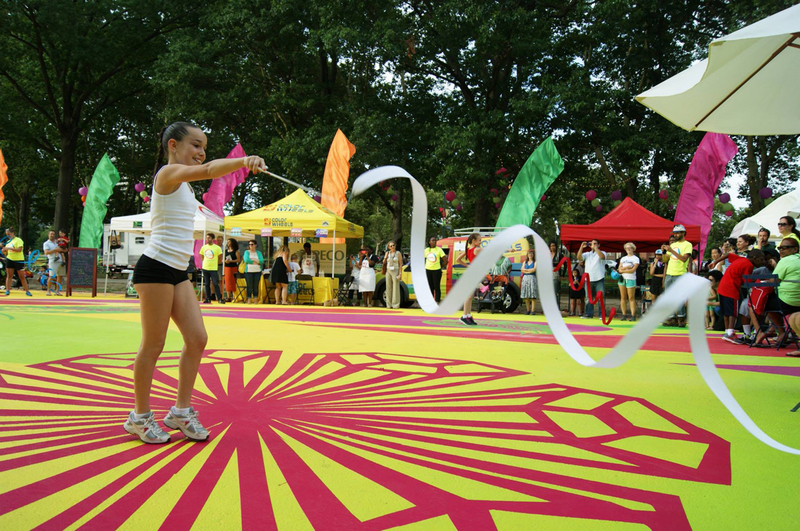 “The Lawn” – Around the edge of the Magic Carpet was a textile-like border of diamond shapes. On the perimeter of the Magic Carpet were oversized buoys, painted with leaf images and embellished with reflective material that was gently animated by passing traffic. 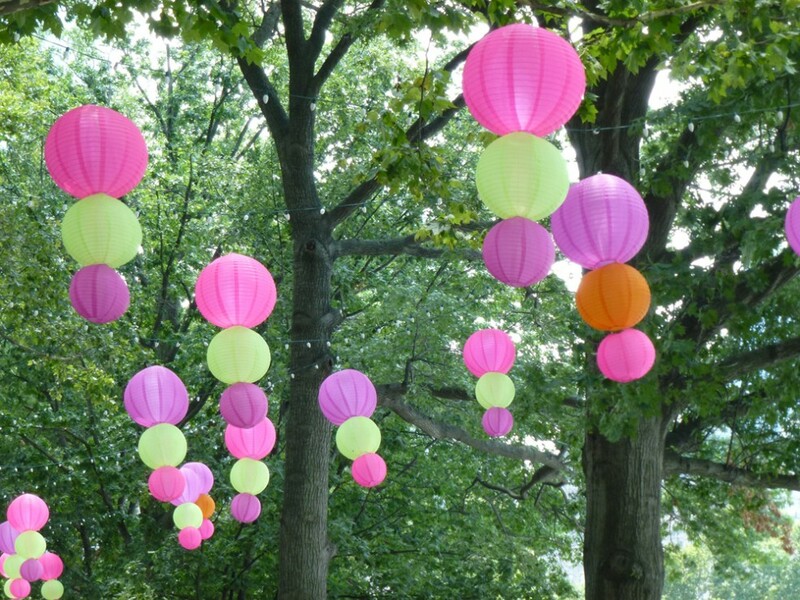 Hanging from the trees were brightly colored vinyl globes hung in pendants with ornamental charms and tassels. There were resting places, playing places, and activities: chairs, balls, volleyball, badminton, bocce, and miniature golf. Candy Coated (formerly Candy Depew) is a multimedia artist who works internationally. 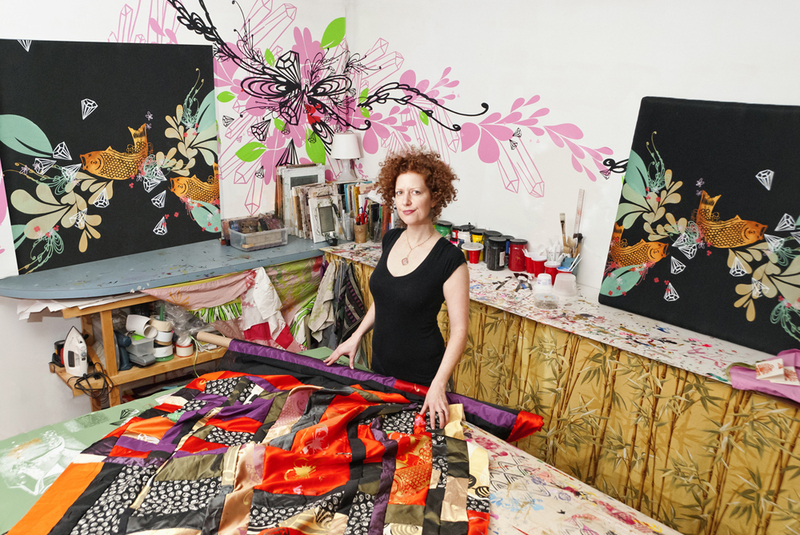 An enthusiast of the decorative arts, her work brings together installation art, popular culture, fantasy, fashion, printmaking and a passion for vivid color. 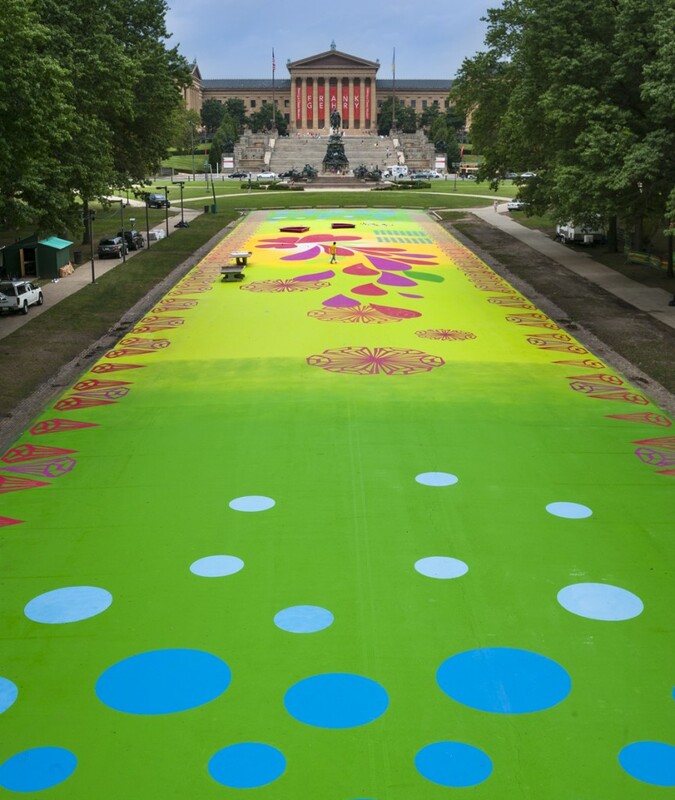 In 2013, she created Candy Coated Wonderland, an installation at the Philadelphia Museum of Art that reinterpreted children’s fancy dress costumes from the Museum’s collection. Candy established her “Studio School” of decorative art & design in Philadelphia. She has also worked as Master Printer at the Fabric Workshop and Museum. 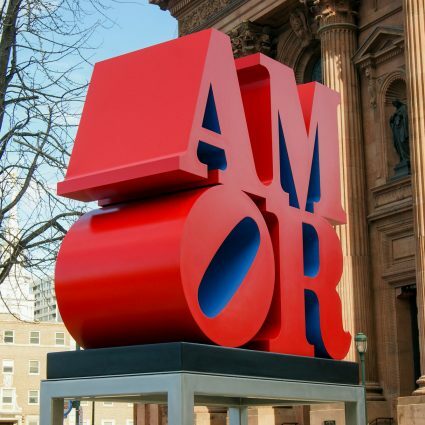 A recipient of the Pew Fellowship in the Arts, Candy complete d her MFA at Tyler School of Art at Temple University and worked with The London Consortium at the Tate Modern, London, United Kingdom. Candy Coated is the multimedia artist who created Magic Carpet. 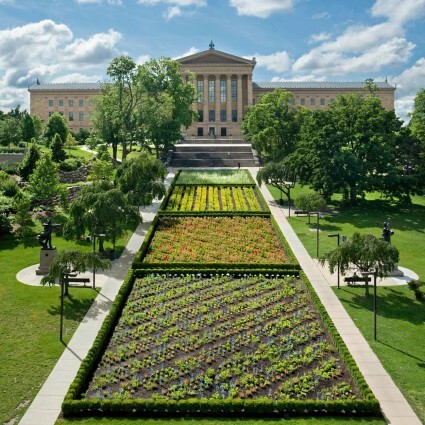 Dilys Blum is Senior Curator of Costumes and Textiles at the Philadelphia Museum of Art. Nicholas Kripal (1953-2016) was Professor, Chair of Crafts Department, and Head of Ceramics Area at Tyler School of Art at Temple University. FREE but registration required and space is limited. Candy teaches participants how to screen print using design motifs from Magic Carpet. Candy leads participants as they decorate and paint parasols inspired by the surrounding landscape. Due to popular demand, Candy teaches an additional screen printing workshop using design motifs from Magic Carpet. For more information about The Oval programming, visit theovalphl.org. 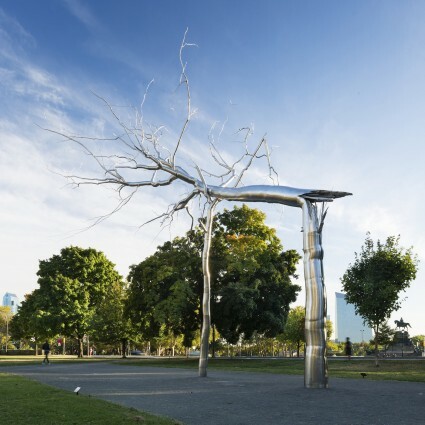 On Wednesday, July 16, 2014, the Association for Public Art, Philadelphia Parks & Recreation, and Fairmount Park Conservancy celebrated the official kick-off of Magic Carpet and The Oval’s summer season. With artist Candy Coated in attendance, this free public event featured activities for all ages, a performance from the Philadelphia Rhythmic Academy, a DJ, food trucks, face painting and more. Andrei Cabrera, Alyssa Choma, Michael Cosenza, Sarah Davis, Greta Galuszka, Jaclyn Garvey, Kala Hagopian, Rebecca Jacob, Cavin Jones, Valerie Lang, Katie Lillard, Andrew McGettigan, Diane Pieri, Lyric Prince, Amber Quisenberry, Mark Rounds, Daniel Scheppard, Jen Schlegel, Brendan Siltman, Chad Smalt, John Souter, Jean Swalm, Jon Weary, Amber Weeks, Ali Williams, and Zack Zubry. Yowei Shaw (Producer), Dilys Blum (voice), Nicholas Kripal (voice), and Jon Shapiro (composer).